Again, here we have a premise that could have been a killer. Unfortunately, it comes across as a drama student project. Not left in the oven long enough. The guilty parties specifically being Seth Rogen and Rose Byrne. Yawn. 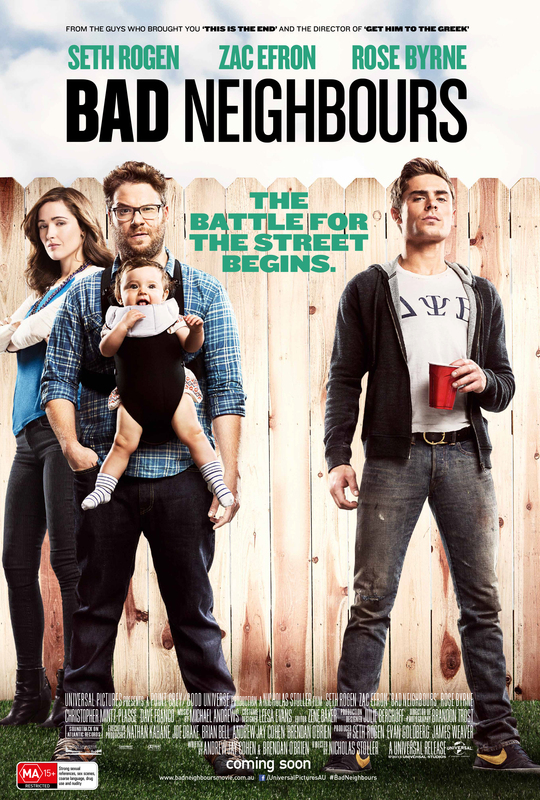 Unconvincingly directed by Nicholas Stoller (Forgetting Sarah Marshall, Get Him To The Greek) this is about a bunch of frat boys (including Zac Efron and Dave Franco) who move into a neighbourhood, next door to a 30-something couple with a newborn (Rogen, Byrne and a baby) . The couple still want to be seen as cool and party heads, but very quickly get tired of the noise and end up calling the police, creating a war between the two parties. Hilarity should ensue, but the coupling of Rogen and Byrne just doesn’t ring true and either the script they were given was terrible or their chemistry and improvisational skills leave a bitter taste. Seth Rogen being usually adept at this. It’s embarrassing as their tête-à-têtes go on for far too long and are neither funny nor clever. A shame then, that Efron and Franco show much deeper comedic skills than the two leads. Efron, who could easily have been written off as that High School Musical kid, is showing the world that he has talent beyond the world of Disney. He was great in Liberal Arts and is definitely one to watch. Franco shows some great comedic timing here and is also one to watch, stepping out of the shadow of his brother and making a name for himself. He was sturdy in 21 Jump St. A worthy mention should go to Jerrod Carmichael as one of the frat boys, whose delivery and later scenes with the very funny Hannibal Buress are by far the best parts of the movie. Also, the surprise appearance of Craig Roberts (Submarine) felt forced and badly edited, a poor reflection on the film-makers rather than the talented actor. A sloppy film that, like many others had potential but ultimately didn’t know what to do with itself. Again, half baked. Someone should have shut down the improv-fest betwixt Rogen and Byrne.